Wood Prylever Bars have a 4,250 lbs. capacity with all welded steel plate bolted onto the wood, 5" x 2" polyurethane casters and a flush plate with beveled edge. 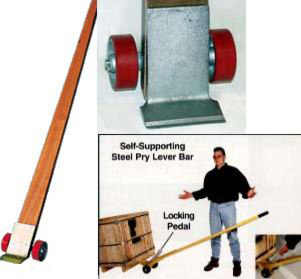 Provide dockworkers, riggers and freight handlers with the leverage to get underneath heavy objects for transporting with fork truck, hand truck, pallet truck or machinery movers. Available in 5', 6', and 7' handles.